On April 9, 2018, eighteen members of the Class of 1966 gathered for a “mini-reunion” lunch at the historic Pilot House on Boston Harbor. 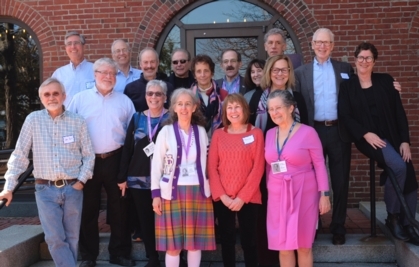 Organized by Robert Sachs, Doug Weinstock and Alyce Kaprow, the largely New England get together attracted class members from as far as Maryland (Michael Turell), Westchester County (Paula Reichler) and Albany (John Heck and Joanne Schwartzman Schlang). Declaring the get together “a success,” attendees talked about future mini-reunions including more class members and possible “road show” events in the US or even Europe. During our reunion preparations, we had an opportunity to meet individuals who worked with the New Rochelle Fund for Educational Excellence, and they generously prepared some of the “Welcome” banners used during the event. After finalizing the accounting for the reunion costs, we had some funds remaining and thought it appropriate to donate to a worthy cause. We felt the NRFEE fit the bill perfectly. On April 29th, on behalf of the NRHS Class of 1966, members of the Reunion committee met with leaders of the New Rochelle Fund for Educational Excellence and the Principal of NRHS to present the Fund with a donation from our class. 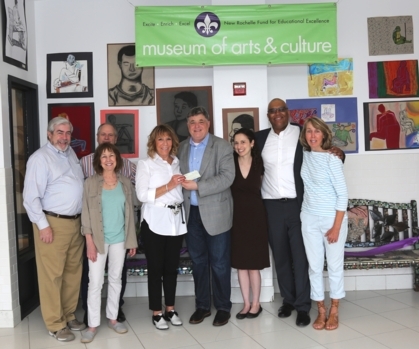 Pictured are (L – R): Jerry English, David Sacarny, Paula Reichler Parker and Joan Sundheimer Schonherz, representing the Class of ‘66, and Stephen Silverman, Chairman of the Fund, Andrea Berman, Executive Director, Reggie Richardson, Principal NRHS, and Laura Heiss, Director, Museum of Arts & Culture. Members of the Reunion Committee who were unable to attend the presentation are Gail Chotiner, Barbara Lorusso Rush and Roni Kaplow Puckhaber. The presentation took place by the entrance to the school art gallery, which displays artwork and other media created by NRHS students as well as notable artists. The New Rochelle Fund for Educational Excellence develops and runs programs throughout the New Rochelle community, benefiting a broad range of children from the community. Established in 1998, the New Rochelle Fund for Educational Excellence was forged in an alliance between the Superintendent of Schools, members of the Board of Education and community leaders to enhance the New Rochelle tradition of excellence in education. The Fund is a non-profit organization that supports the school system and its extraordinary, diverse student body through advancing equity, excellence and inspiring all public school students. The Fund partners with the City School District of New Rochelle and engages the broader New Rochelle community to develop, fund and implement high-quality educational and enrichment programming that enhances the school experience and helps students thrive and succeed along their educational journey. Their key values are focused on Integrity, Empathy, Accessibility, Respect, Confidence, Innovation, Creativity, Community and Volunteerism. The Fund operates with a streamlined staff that relies on volunteers to carry out its mission. The Board of Directors is comprised of parents, staff, community leaders, the Superintendent of Schools, school administrators and a Board of Education representative. We would like to welcome you to our NEW Class of ‘66 website created to help our classmates keep in touch, not only with the Class (Reunion) Committee, but also with each other. For those of you who were familiar with the original reunion website, our NEW site is far more robust, providing access security that will allow you to decide what information about yourself you want to share. We encourage you to explore and give us feedback, and would also appreciate if you would share this information with any classmates who we have not located, and ask them to join as well. We would also like to thank everyone who was able to attend the recent 50-year reunion celebrations in October 2016 and hope you had a wonderful experience. For our friends who were unable to attend, we missed you and hope that you’ll be able to make the next get-together. We have also uploaded all the photos from the Reunion, as well as pictures provided by friends, and pictures of the 35 year reunion. Enjoy the site and if you have any suggestions on content, please let us know. If you have any questions at any time, please contact Jerry English for assistance.